This portrait of Jensen edging the lawn shows the great pride he took in every aspect of his work. Ca. 1895, courtesy of the Johnson, Jensen, and Wheeler families. Danish immigrant Jens Jensen (1860-1951), who began as a street sweeper for Chicago’s West Park System, went on to become one of America’s most acclaimed landscape architects and conservationists. In the 1890s, Jensen worked from an office in the Humboldt Park Stables. This building now houses the National Museum of Puerto Rican Arts and Culture. NMPRAC serves as one of six neighborhood anchor sites for Chicago’s second Architecture Biennial and, in honor of Jensen’s ties to the park and the building, museum officials asked me to curate a small exhibit in the room that originally served as Jensen’s office. Entitled Humboldt Park: Jens Jensen’s Living Laboratory, the exhibit will remain open through the Biennial (September 16, 2017-January 7, 2018). The museum is located at 3015 W. Division and admission is free. In celebration of the Biennial, NMPRAC is hosting a reception on Thursday, October 12, 6:00-8:00 p.m. This event is free and open to all, so please stop by (RSVP online). National Museum of Puerto Rican Arts and Culture in Humboldt Park, 2017, photo by Julia Bachrach. In the late 1890s, Jensen worked from an office in the turret shown here. Jensen emigrated from Denmark for several reasons; the most compelling was love. Jensen’s wealthy parents considered his fiancé, Anna Marie Hansen, beneath their station and would not support the marriage. So, Jens and Annie left everything behind to create a new life together in America. Settling in Chicago in 1885, they moved into the Humboldt Park neighborhood, where they lived among a large population of Scandinavian immigrants. After briefly working in a soap factory, Jensen was delighted when he found a job as a laborer for the West Park Commission. He soon became a gardener and quickly began working his way up through the ranks of the park system. Jens and Anna Marie Jensen are depicted on a tandem bicycle in front of their apartment at 574 (now 1113) N. Sacramento Avenue. Over a 20-year period, they lived in four different apartment buildings near Humboldt Park. Ca. 1900, courtesy of Morton Arboretum Special Collections. The Greystone where the Jensen family lived in the late 1890s still exists today. 2017, photo by Julia Bachrach. Jensen was appointed Humboldt Park’s superintendent in 1895 when the new stables (called the Stables and Receptory) was under construction. He soon became the first employee to occupy the superintendent’s office in the building’s turret. He took care of day-to-day operations, supervised the staff, wrote articles for national gardening magazines, and designed a few small park landscapes including a lily pond just south of the turret. Despite excelling at his work, Jensen found himself in a difficult position. By the late 1890s, dishonest politicians permeated the entire park system. Jensen, who became known as the “graft-fighting Dane,” stood up against the corruption. However, since his superiors benefited from the patronage schemes, they forced him to resign in 1900. Jensen struggled to support his family, but also made time to participate in conservation and social reform organizations. Several high-profile Chicagoans were impressed by him. In 1905, reform-minded governor Charles S. Deneen overturned the corrupt West Park Board and appointed a slate of honest and progressive citizens. The new board selected Jensen as the General Superintendent and Chief Landscape Architect for the entire park system. As the parks and boulevards had fallen into “deplorable condition,” the commissioners directed Jensen to create ambitious improvement plans. Over the next couple years, they approved $2 million dollars in bonds to fund the work (the equivalent of more than $50 million today). This marked a turning point for the talented designer and park manager. Jensen’s Plan of Proposed Improvements to Humboldt Park included Prairie River, a music court and boat house, and the circular Formal Garden. 1907, Chicago Park District Records: Drawings, Special Collections, Chicago Public Library. Looking northwest from the fork in Prairie River, this view shows the Japanese tea house which remained for at least 50 years. 1908, Chicago Park District Records: Photographs, Special Collections, Chicago Public Library. Of all of Jensen’s landscape designs of this period, his work in Humboldt Park proved to be the most exciting. 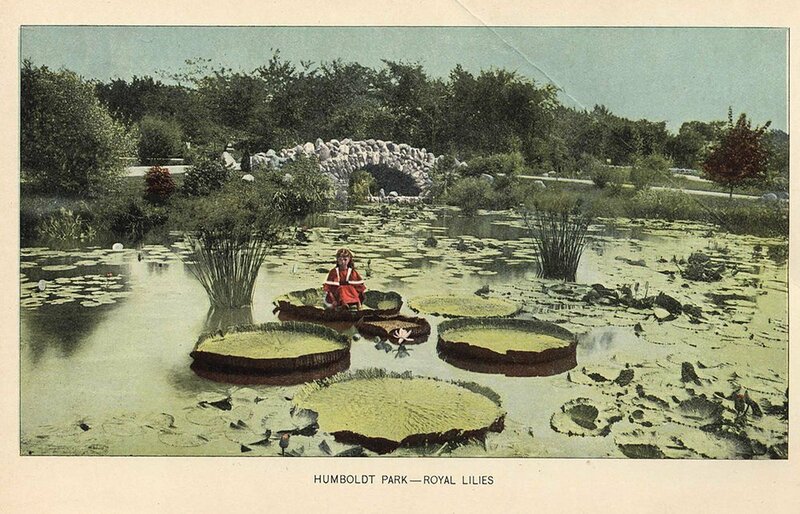 In essence, Jensen treated Humboldt Park as his “living laboratory.” He wanted to expand the park’s existing artificial lake, but rather than adding another Victorian lagoon, he created Prairie River – a long, meandering, naturalistic waterway, edged by native plants and rocky cascades with stepping stone paths. Nearby, he designed a Japanese tea house. He also incorporated Prairie-style architecture such as the Boathouse, designed by the talented Prairie School firm of Schmidt, Garden and Martin. In this photograph, you can see park visitors relaxing under the garden’s west pergola, ca. 1915. Chicago Park District Records: Photographs, Special Collections, Chicago Public Library. Despite a somewhat conventional layout, Humboldt Park’s Formal Garden was quite innovative. Jensen recessed the semicircular beds so as not to interrupt the horizontality of the broader landscape. In a 1915 publication entitled the Prairie Spirit in Landscape Gardening, Jensen suggested that he wanted the flowers in the Humboldt Park garden to be planted low “as they are on the prairie in the spring.” He said he enclosed the upper terrace with trees “to suggest the meeting of the woods and the prairie.” Jensen also enhanced the garden with pergolas, wooden benches, Teco-ware urns, and Prairie-style entry lanterns. Historically, Humboldt Park’s Formal Garden featured five continuous rings of roses and other perennials, but now has only two rings of annual beds. 2017, photo by Julia Bachrach. Today, the Formal Garden is still beautiful but, it needs revitalization. In 2016, community members formed a Jensen Formal Garden Working Group, and with help from the Chicago Parks Foundation, the Garden Conservancy, Chicago Park District, and Humboldt Park Advisory Council, a team of landscape architects and horticulturalists has been hired to create a plan for the historic garden. The team includes Piet Oudolf, the famous Dutch garden designer whose American work includes Lurie Garden in Millennium Park and the High Line in New York. To learn more or to give a donation, visit jensenformalgarden.com. I really enjoyed working with NMPRAC and feel very saddened about the devastation caused by Hurricane Maria. Please consider donating to NMPRAC for Hurricane Maria Relief.